A Breakthrough in Helping Children with Autism. To build communities of caring, we see a need to teach and promote empathy. Most programs for children with special needs place the emphasis on modifying the child’s behavior. We know that autism is not a behavioral disorder, so the Love Andrew team with the help of Oakwood Middle School is putting together a new group program designed to help typical kids understand and be friends with someone with special needs. The pilot group consists of seven boys, chosen because they display good character, empathy, and kindness and Andrew. In order to give the boys an idea of what things are like for Andrew, a special demonstration was set up to illustrate what being overwhelmed by sensory input is like. The boys were asked to complete a trigonometry test, hard enough by itself, but with the addition of strobe lights and constant sounds for competing phone ringtones. No one was able to concentrate and finish the quiz. Everyone has things they’re good at and things that are challenging for them. What this exercise showed the boys was that people with autism have to do their challenging activity 24/7. Without a place like the Star Room, there’s no way for them to regroup to put their best effort forward. As the program unfolds, we will take what we learn to develop and refine it. Next year it will be open to other children and ultimately become a program that other school counselors can use wherever there’s the need. 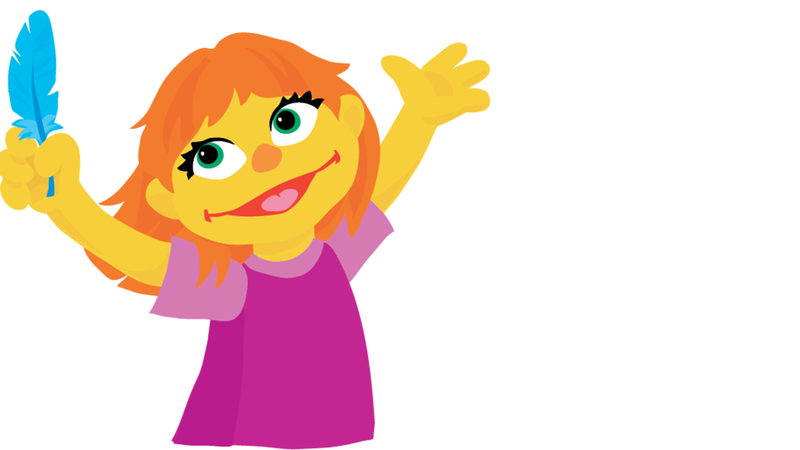 Many of our friends and supporters send us links about Julia, Sesame Street’s newest Muppet. Of course we were very excited about the character and happy with her introduction. What makes the addition of Julia especially significant to us, is the way the Sesame Street creators chose to portray her as a child with autism. The character took years to create and a lot of careful consideration went into her every detail For instance, though more boys are diagnosed with autism, (1 in 42, compared to 1 in 189 for girls) the show’s creators made a conscious decision to create a girl character so people wouldn’t think only boys are on the spectrum. What’s really important about the character is how she’s described – a child who does things differently. Children with autism are five times more likely to be bullied in school, so teaching empathy is an important foundation. “Our goal is to bring forth what all children share in common, not their differences. Children with autism share in the joy of playing and loving and being friends and being part of a group” said PBS senior vice president of U.S. social impact, Dr. Jeanette Betancourt. It’s significant to Love, Andrew to see a nationally recognized and beloved children’s show portray a child with autism in a positive light. For more information and resources for parents and children, visit http://autism.sesamestreet.org/. The holiday season is almost here, and you can help Love, Andrew just by doing your normal holiday shopping. If you shop on Amazon, you can make a contribution to Love, Andrew with each purchase. Amazon Smile is an easy, automatic way to support your favorite charity. With every purchase, Amazon donates a portion of your purchase price at no cost to you! Simply go to smile.amazon.com, search for “Love Andrew Autism Foundation” when asked to select your charity and get back to shopping. The Warstler Star Room is coming along, and we’re all working to grow out constellation of caring. Thank you in advance for your support! The Love, Andrew Autism Foundation is proud to announce the addition of Alessandra Gesiotto, Miss Ohio High School America, as Teen Ambassador for the organization. Gesiotto’s responsibilities include promoting autism awareness in the younger generation, promoting inclusion and acceptance of children with autism in school and everyday life, assisting with fundraising, promoting the Love, Andrew Autism Foundation statewide and nationally through social media and other channels. Gesiotto, a junior at Jackson High School, is no stranger to community service. The 17-year-old is a member of the F.U.S.E. (Friends Unite Students Everywhere) Club, which organizes inclusive social events for typical teens and their peers with special needs. Gesiotto, who was born with a heart defect, participates the yearly heart walk for the American Heart Association. She has worked with her family to raised more than 25,000 dollars in one night for the Wounded Warrior Project, and she has participated in and helped organize the Love, Andrew fashion show, Light Up the Runway for Autism. Gesiotto currently holds the title of Miss Ohio High School America, and will be competing for Miss Ohio Teen USA on November 7, 2015, in Springfield, OH. If she wins, Gesiotto plans to adopt the Love, Andrew Autism Foundation as her platform during her reign. We’re on the move with our next Star Room! Warslter Elementary is preparing space to become our next Star Room. 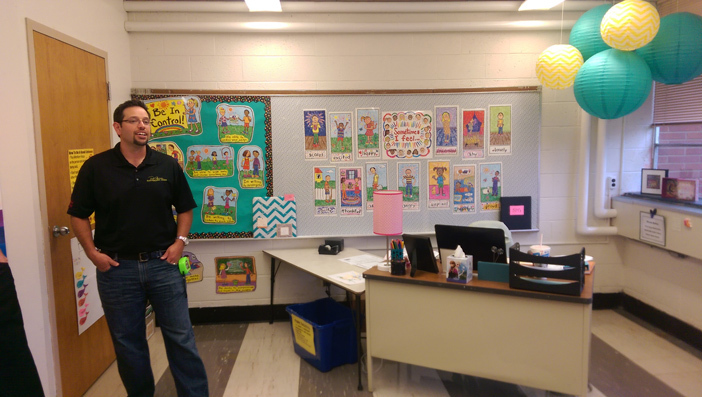 Warstler put forth a lot of effort in creating an environment that addresses the needs of children with disabilities. Now the school is going forward to address the needs of children with autism and other spectrum disorders. The Warstler room will be unique in our current constellation of Star Rooms in that it will feature an observation area. This will allow the school to become a training center so teachers and counselors can learn to develop the positive environment that’s been so critical to the success of our pilot Star Room. Attitude and approach are just as important as the reduced-stimulus environmental design, so this is a critical next step. Parents and teachers will be able to witness firsthand the positive effects on the children. 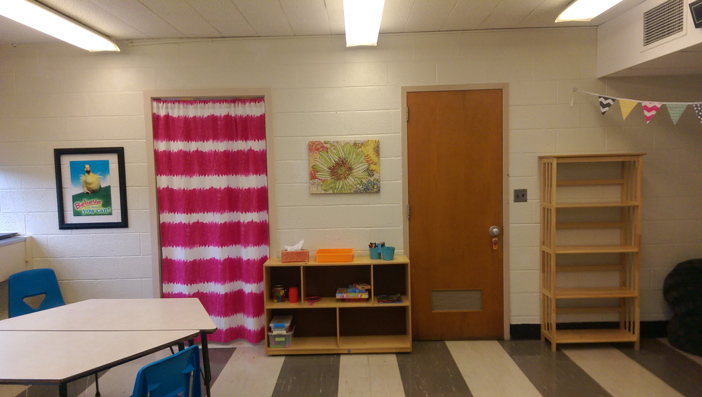 The Warstler Star Room expands our inclusive approach by serving as an environment for tutoring students who need a quiet space and as a resource for speech and occupational therapy. 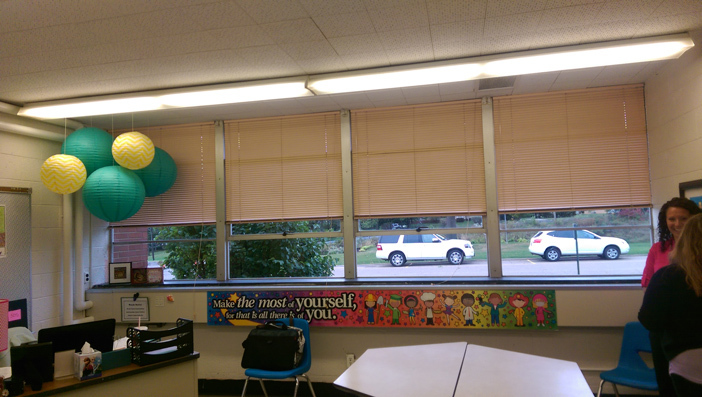 After settling on an ideal location in the school, volunteers from Schumacher Homes are beginning prep work to transform the former classroom into a Star Room. Here are a few before images, showing the room that will become the Warstler Star Room.